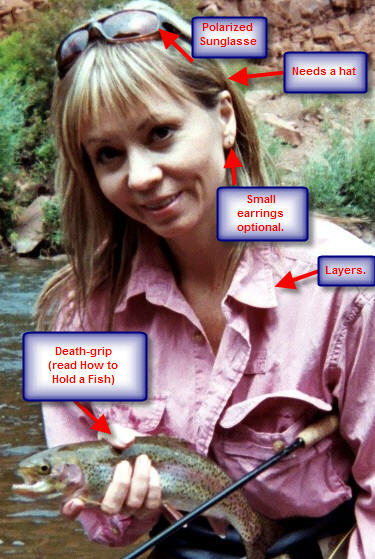 Fly Fishing Basics What To Wear Fly Fishing! 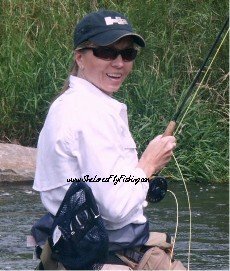 Fly Fishing Basics , as far as I'm concerned, start with what to wear fly fishing! The most important thing for hitting the water is to be prepared! You don't want to hike a mile or more into the secret spot on the river, and then realize you didn't wear enough clothes or you're going to fry in the sun. Looking good on the water is secondary - let's talk about the basics here. The fishing gear will come later. Then all the fishing gear. These are the items a girl must have to have a comfortable day on the river and avoid sun damage. If you forget even one thing, your day will be negatively affected. Forget your hat? That tender 'part' atop your head will burn and you won't even know it until you run a brush through your hair the next day. No lip-balm? Your lips will be parched by the time you get your tippet tied on. The issue is that the sun reflects off the water and bounces up onto your person in magnified doses. All the damage the sun does on its own is multiplied when you stand in a river. Protect your beautiful skin! More Fly Fishing Basics - Wear Polarized Sunglasses!